The Rev. Steven Delzer, formerly pastor of Our Savior’s Lutheran Church, Faribault, Minnesota, was installed as bishop of the Southeastern Minnesota Synod of the ELCA during a September 7 service at St. John’s Lutheran Church in Owatonna. Presiding Bishop Mark Hanson was the preacher. “I was surprised how heavy those hands [of the bishops during the installation blessing] were on me,” Delzer told the congregation. “It is a reminder of the tremendous weight of this call, … the call to be a slave,” referring to the day’s assigned gospel reading (Mark 10:42-45). Delzer, who received his M.Div. 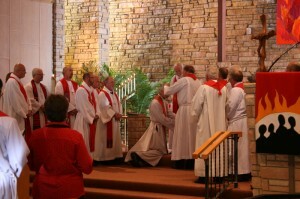 from Concordia Seminary–Seminex, St. Louis, Missouri, in 1975, explained, “You heard me say at the synod convention, ‘I love this church.’ And I do, … because it welcomes many people, and I’ve experienced that personally.” Prior to 2000, Delzer had served congregations in the Lutheran Church—Missouri Synod. The Rev. 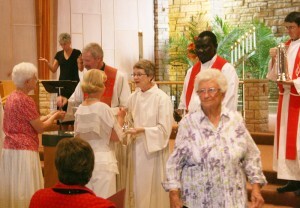 Steven Delzer (center) shared communion during his installation service as bishop of the Southeastern Minnesota Synod of the ELCA at St. John’s Lutheran Church in Owatonna, Minnesota, on September 7. He cites his education at Seminex as influencing his ability to be flexible and to adapt to change, a significant factor cited by voting members who elected him as bishop. Delzer’s Faribault congregation has welcomed Sudanese Christians who have established a Lutheran worship service for area immigrants. Delzer was elected bishop at the synod’s annual assembly on June 8 in Rochester, Minnesota. He succeeds Usgaard, who had been bishop since 2001 and was not eligible to seek re-election.